Last week I raised the issue of truth, concerning my comments about orchestra conductors. In early 2015 I did a blog about truth, which is revisited this week, with some editing. In 1492, Christopher Columbus discovered truth: that the world is round, not flat. Did he? Is it? Not long after that, in 1535, Jacque Cartier crossed the same ocean and sailed way up a mighty river, until he had to stop at an island just short of the first rapids. There he saw a mountain, which was later named Mont Royal, for the king of France. 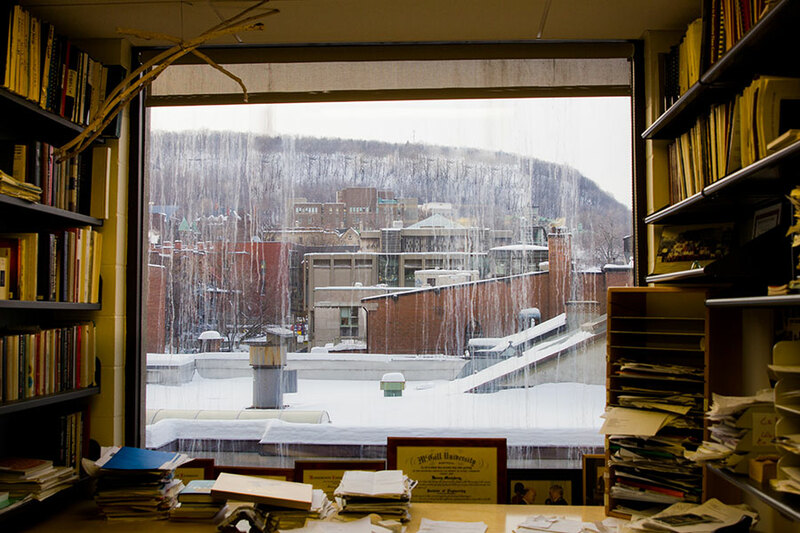 Now, almost half a millennium later, my office in Montreal faces that mountain. Have a look at the photo below; it offers definitive proof that the world is neither round nor flat. Mount Royal from my Montreal office. Sorry about what Santa, my assistant, calls our stained glass windows. They are not cleaned in the winter. Why must I tell you this? Because we have to appreciate that while facts may be true—that mountain is there—theories are not. How can they be when they are just generalizations, namely words and symbols on paper or screen, not reality itself? Theories can, however, be useful, or not, depending on the circumstances. The flat earth theory is still quite useful for building football fields in Holland. (Can you imagine an engineer saying: “Please raise one end a millimeter or two to correct for the curvature of the earth”?) But when it comes to sailing ships, the round earth theory works much better (even though the earth is not round—it bulges at the equator—although what to do with the oblong theory of the earth I do not know). And anyone who likes to climb mountains has to be a fan of the bumpy earth theory (although I heard somewhere that if we reduced the size of the earth to a billiard ball, we would not be able to feel Mount Everest). Many proper scientists just don’t get it. They fight with each other furiously over their respective theories, without recognizing that all may be right, and wrong, depending on the circumstances. Don’t we still make greater use of Newton’s theory of mechanics, which was supposedly debunked by Einstein’s theory of relativity? It has been much the same with those economists who poo-pooed Keynesian theory for years, only to rediscover it during the recent financial crisis. There has been concern of late about the measles vaccine: by failing to have their children inoculated, parents are being accused—rightly—of putting other children at risk. To convince these parents, proper scientists and physicians have been announcing that the vaccine has been proved safe. This is not true, nor is it proper science, which can disprove beliefs but never quite prove them.1 The truth is, so to speak, that the tests have not found the vaccine to be harmful, so far. If you doubt the difference between these two wordings, consider all the medical treatments that were declared safe only to be later declared unsafe. Science marches on, unpredictably. © Henry Mintzberg 2015/6 Photo © Lisa Mintzberg Follow this TWOG on Twitter @mintzberg141, or receive the blogs directly in your inbox by subscribing here. I also just started a new Facebook page. 1 Karl Popper wrote a famous book entitled The Logic of Scientific Discovery, which was not about the discovery of theories—the interesting part—but about the falsification of them. Another assistant of mine once typed his name as Karl Propper.